CHILDREN and adults dressed in a variety of silly costumes at the fourth annual Shiplake village picnic. For the first time this year, the Shiplake and Dunsden Dramatic Organisation had a stall where visitors could try on costumes and props from the group’s collection. 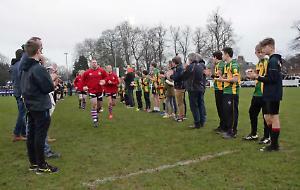 Youngsters and their parents ran around the village playing fields off Memorial Avenue, where the event took place, dressed as parrots, gorillas, bears, princesses, pirates, pantomime dames and more. There was also a face-painting stall for younger children and a series of stacked hay bales which they could climb up and jump off. Children could also ride on a “hover board”, a motorised scooter that moved forward and backward automatically as they shifted their weight. Other attractions included a fun run, a tug-of-war between boys and girls which the girls won and a barbecue run by Shiplake Butchers. Families sat eating picnics on blankets and adults enjoyed ales provided by the Loddon Brewery, of Dunsden. The Shiplake Community Choir sang popular songs including numbers from classic musicals and a medley of themes from James Bond films. There were also performances by Shiplake College students, singing duo Pip and Adam and country band Rywolf. Refreshments were served inside the memorial hall.